Welcome to Modern Playables. Dragons of Tarkir has been fully spoiled, and so, with a new set comes the question: which of these cards is truly viable in Modern? We’re here to help you sort through the muck to tell you what’s a yes or maybe, and where it all fits. Here are the cards in Tarkir that are most likely to make waves in Modern. These cards will probably go into top-tier decks or give other decks a much-needed boost. They might even enable new decks all on their own! Sheridan: If I had to make one longshot bet for the set, it would be this card. I view it like a white, mini-Delver that goes in control decks, Enchantress decks, and perhaps even UWR Delver/Midrange strategies. Although the Monk Avatar doesn’t have evasion, this guy can easily be a giant 6/6 or larger beefcake by the time he gets going. It’s a great mana sink for low-action turns, it works just fine in multiples, and at 1 mana to cast and 1 mana to activate, it’s a very low commitment. I’m not sure if control decks want to open themselves up to Abrupt Decay to run this kind of win condition alongside or instead of Colonnade. But like the Delve mechanic that was so broken in the last two sets, Myth is a card that just rewards you for playing Magic. It’s a tiny bit slow for some of the more aggressive decks like UWR Delver/Midrange, but if you want a midgame or higher-range win condition, this might be the card for you. Sean: Competes with White Sun’s Zenith as a control finisher in Esper (see Wafo Tapa’s list here) and possibly other decks. Let’s do some math, shall we? And on it goes. So the power difference isn’t huge, it’s less mana intensive, and more flexible with its casting cost, but the tokens can’t profitably block as many creatures, and the card doesn’t shuffle back into your library. All things considered, I’m unsure if it will see play in control lists or not. Sheridan: Looks like a great 1-2 card inclusion for BW Tokens. WSZ was never really playable there because it couldn’t do anything in the early game. This card is never quite dead in Tokens and will definitely close out a game on turns 5-6. There are a few top-end flex slots in that deck anyway (2-3 Hero of Bladehold, 2-3 Sorin, Solemn Visitor, etc. ), and Secure fits nicely into one of their slots. I expect to see at least 1 of these in BW Tokens decks as a way to go over the top of midrange and control decks that try to play too fair. Sean: A decent sideboard card for Burn that effectively reads: counter target burn spell and destroy target Goblin Guide. Sheridan: Reasons to play this over Celestial Purge? The big one is that this is almost a two for one, killing a creature and stopping 2/3 of a Bolt effect. Reasons not to play it over Purge? You can’t hit Keranos or Lily with this, and conservative Burn players might not throw their Eidolons into Surge’s crosshairs. But if you are delaying an Eidolon attack, that’s not terrible either. Sean: A smaller Impulse and cousin to Telling Time, this could be the best option for blue combo decks that want to dig beyond the 1 cmc options, especially if they go long (Scapeshift). When you want two of the cards seen, it’s worse than Time, but always having one card you want and a blind draw seems better overall than sometimes having two cards you want, and sometimes having one you want and don’t want. Sheridan: In most cases, this is going to be better than Time. When evaluating the two cards, I ask myself which is more likely: 1) That I flip 0-1 good cards or 2) That I flip 2-3 good cards. If I flip 2-3 cards that I want to keep, then yes, Time is better. But if I flip 0-1 cards that I want to keep, then Time is a disaster. Not only do you maybe not find the card you want, but you also now have to draw a card you didn’t want. So Time is actively setting you back a turn. With Anticipate, even if you see a card you wanted and had to ship it back, you at least get a chance next turn to draw something equal or better. And if you didn’t see a card you wanted, then you get to keep digging without losing an entire draw step. Sean: One of the strongest sideboard cards from Tarkir, cheaper Combust, which was usually for Pestermite and Deceiver Exarch anyway. Thanks, Wizards! Any red deck that has trouble with Twin should be happy to run this. It also hurts Jeskai. Sheridan: This will see sideboard play across the format. In addition to killing Exarch and Mite, it also can’t be stopped by the Twin staple of Spellskite. Combust was decent at 2 mana, but bumping it down to 1 makes it much better in this format. Volley might not hit Rhino, but if you were playing either Combust/Volley in the Abzan matchup to begin with, you were doing it wrong. Also, Celestial Colonnade and Restoration Angel are unhappy. Sean: Flame Slash currently fills the role of dirt cheap Goyf and friends removal; Roast is a bit more expensive but kills many other key creatures (Siege Rhino, Tasigur, etc), which could warrant it sideboard or even mainboard slots in red tempo decks. Sheridan: Anyone who maindecks Slash needs to seriously consider switching that out for Roast. In a format that is somewhere around 15% Abzan, the ability to blow up the Abzan triumvirate (Goyf, Rhino, Tas) is huge. Of course, if your only reason for running the Slash is to kill enemy Spellskites to clear the way for a combo, then that’s one thing. But if you aspire to a more interactive game plan, Roast becomes a lot better. It’s competing with the already-played Harvest Pyre for this slot, but in decks that don’t play lots of creatures of their own, I think Roast is way more reliable. Sean: Stompy has been doing well in small tournaments since its first showing at the Grand Bazaar of Moxen tournament back in May 2014, and this card looks to give it another nice boost thanks to its Reach ability and synergy with Strangleroot Geist, Experiment One, and Scavenging Ooze. I don’t think it’ll be enough to push it to tier 2, even if we attempt a traditional Stompy build with 1 and 2 cmc cards only (think Dryad Militant, Experiment One, Garruk’s Companion, Kalonian Tusker, Avatar, etc), but I’ve been surprised before. The reach is more important than you might think, given Affinity causes the deck trouble sometimes, and Lingering Souls is everywhere right now. Sheridan: Stompy players rejoice! Avatar is a strict upgrade to Companion, a maindeck interaction with Souls tokens and the flyers of Infect/Affinity, and a much better topdeck than cards like Companion/Tusker. Stompy has sometimes struggled with midgame pressure, especially when you are topdecking turn 5 Tuskers and your opponent is topdecking turn 5 Rhinos. But if that Tusker has the potential to be a 5/4 (or bigger), that’s a game changer. Note that if you go turn 1 E1 into turn 2 Avatar, you don’t get the counter on the Avatar itself. Solution: wait until turn 3! Sean: Has potential for slower Stompy lists as well as Elves. I’m inclined to believe Stompy is best served by capping the curve at 3 (possibly even 2), but there’s no denying Collected Company should be tested in it (Collected Company into two Leatherback Baloth seems good). Combo Elves probably doesn’t want this card (it wants to run a reasonable amount of non-creature cards), but an Aggro Elves list with a playset of these might do well. 3 cmc is the magical number for Elves, so that hurts its case, but instant speed and entering the battlefield instead of going to the hand (like with Lead the Stampede) are advantages that can’t be ignored. Sheridan: If you were wondering why Congregation at Dawn got sold out across the internet last week, this is why. Pod players will be familiar with how this works. Cast Congregation and put Kitchen Finks, Melira/Anafeza (the new one; more DTK action! ), and Viscera Seer on top with Seer first. Next turn, draw the Seer and cast both it and Company. Profit. Company seems strong in a number of fringe decks like Shamans, Elves, and those Podless Pod decks we have seen on MTGO. To maximize this card, you don’t want to just make it a combo engine. You also need to be able to get value off it, which means playing lots of creatures to flip. Sean: Command is likely to make Burn go deeper into green, if only because its damage ability doesn’t target, thus alleviating the Leyline of Sanctity weakness. Whether Burn players will replace Skullcrack with this or run both I’m not sure, but either way, it has a definite place. One of the stronger cards from Tarkir. Sheridan: Do not think of this as Skullcracks 5-8. Instead, think of Skullcrack as Commands 5-8. In my opinion, AC is by far the most playable of the DTK cards. This is an auto-include in Burn, a probably-include in Zoo, and a definitely-hate for anyone who doesn’t like the Burn matchup already. It stops lifegain, it pumps Swiftspears and Guides, it accelerates you into an additional Bolt effect off a third land, and it gets around Leyline. It’s almost scarier in Zoo, a deck that can take better advantage of the acceleration effect and the mass Silk Net. Sheridan: This is one of the clear Modern playables for me. Abzan, Abzan Liege, and Naya Zoo benefit from all of these modes, especially in a metagame that is packed with Burn. You are almost guaranteed to 2 for 1 Burn pilots with this card, whether in countering a Bolt effect and edicting a Eidolon of the Great Revel, fighting one creature and saving another from something like Searing Blood, or some other combination of those effects. DC is also strong against the other top decks of the format: Twin and Abzan. Against Twin, you can kill the namesake enchantment, stop burn spells, and destroy their creatures. Bonus points for getting rid of the otherwise unstoppable Keranos, God of Storms, a classic bullet used against Abzan midrange. And against Abzan itself, DC breaks open Siege Rhino, Tarmogoyf, and Tasigur, the Golden Fang staring contests. When you have a card that’s relevant against the top three decks in the format, you know you are looking at good sideboard and maybe even maindeck material. Sean: This has some potential in an 8Rack red splash list of the hard control variety (as opposed to the tempo-based variety Pete Casella ran recently in an SCG IQ). Returning a Pack Rat or Grim Lavamancer is nice, instant speed discard is welcome, artifact destruction helps the Affinity matchup, and we love the ability to speed up our clock or remove a creature. Still, I’m not sure it’s high impact enough to warrant its 3 cmc, given what else we can run at that cost. Testing will tell. This also has potential in goodstuff BRx decks. Sheridan: Another playable Command from Tarkir! I’m loving this in Grixis Delver. Recurring a Delver of Secrets, Young Pyromancer, or Tasigur on top of a Shock effect is pure value. Same thing if you can blow up an opposing Inkmoth Nexus, Cranial Plating, or Spellskite in the deal. Decks that want to use this (like Grixis Delver) will be able to abuse the Raise Dead effect, which makes this a great topdeck at any time in the game. Sean: Could be very strong in UWx Control decks, or a bit of a dud. Its key drawbacks are that the +1 ability will miss sometimes, and that Restoration Angel and Snapcaster Mage make it sad. In UWBx, Rebounding Lingering Souls is nasty. When it works it will be stupid good, it’s just a matter of how often it works, and if it does more harm than good. It’s high loyalty is a form of protection, as is the shell you want it in. Probably the best planeswalker from Tarkir, although it’s not like there’s much competition. Sheridan: Toughest card to evaluate in the set. Every time you find something good or bad about Narset, you find something else that balances it out. Narset costs 4, which is right in the playable casting cost for Modern. But none of her abilities interact with the board or directly defend her, which is exactly what we don’t want to see in Modern. But then again… she “starts” with a whopping 7 loyalty; if you ever tested or played Ashiok, Nightmare Weaver, then you know how awesome a high starting loyalty is on its own. 7 puts Narset out of range of a LOT: Abzan creatures, Snap + Bolt, Electrolyze + Bolt, Swiftspear + Bolt, etc. But just when you thought you found something good, you see that the +1 doesn’t even draw you cards all the time! Even in a deck jammed with 30 spells, that’s still about a 40-50% chance to miss your draw on an activation. As for her other abilities, rebound on Souls is excellent (hurray!) but rebound on your sorcery speed Bolt/Helix is not quite as good (booo!). The ultimate shuts down control and combo decks (hurray!) but isn’t game over against midrange and doesn’t do much at all against most aggro (booo!). So overall, she’s a very tricky card to evaluate. I see 1-2 Narsets making the cut for Esper Control and 4C Control, but nowhere else. Sheridan: The Dragons of Tarkir edition of Sarkhan is a pretty modest dude. His +1 is a nice unconditional draw engine, and his -2 will win the game over time. Unfortunately, his ultimate is, more or less, totally irrelevant in Modern. So if Sarkhan is playable, he needs to be carried by those first two abilities. I am skeptical of his playability because those dragons just aren’t big or bad enough. 4/4 flyers get blocked by 1/1 Spirits any day of the week. And 4/4 flyers can’t tangle with the big ground-pounders of Abzan, like Rhino, Tas, and Goyf. But he’s also a pretty decent finisher in Temur Moon-style lists, similar to Hoogland’s 7th place list at SCG Baltimore. Some of the cards from Dragons of Tarkir just miss the mark or just don’t have a home yet. Others inspire cool brews or slot into some decks that needed a little love. Either way, don’t count on the selections below taking down the next Grand Prix, but also don’t count them out of the format just yet! Anafenza, Tree-Kin Spirit: Melira 2.0 (alongside Finks/Seer, at least). Melira might steal games from Infect, but ghost-Anafenza has way more relevance in other matchups. Even in decks that don’t care about persist combo shenanigans, Anafenza is a nice mini-lord that helps your deck grind through an enemy’s defenses. Living Lore: Are your Johnny senses tingling? Probably not playable, but it’s hard to not get excited by the prospect of pairing this with Cruel Ultimatum, Enter the Infinite, Time Stretch, Worldfire, or any of the other insane high CMC sorceries and instants of the format. Impact Tremors: Norin the Wary decks use cards like its namesake and other little creatures to trigger enter-the-battlefield effects and take over a game. Tremors is a cost-effective and high impact (couldn’t resist) engine for that deck. Qal Sisma Behemoth: A 5/5 for 3 is always going to turn heads, but the drawback on this one is a bit steep. If you play Behemoth, ask yourself why you aren’t just playing Gurmag Angler instead, a creature that will almost always be a 5/5 for 3 with basically no drawbacks. Thunderbreak Regent: Doesn’t die to Bolt or Abrupt Decay, and if they kill it, it’s a Lava Spike. Could be a solid 4 drop in Jund, but is it worth stretching the manabase to compete with Hellkite, especially in the Souls-infested metagame? Assault Formation: There’s a little discussion going on now that this card could open the door for a respectable Wall deck (which would probably include Doran). If this deck turns out to be playable, it will be on the backs of the 4 maindeck Spellskite that its deck will be running. Add to that some other playable walls like Wall of Omens, Wall of Roots, and Nyx-Fleece Ram, and you have the start of a spicy brew. Ojutai’s Command: Cryptic Command-esque with different advantages and disadvantages. To evaluate this in the context of UWx Control: the recur Snapcaster mode is absurd, lifegain is very relevant against aggro, creatures are usually your biggest problem, and you love drawing cards — what’s not to love? Then again, it doesn’t counter any spell, which is definitely something a control mage won’t love. Some UWx Control lists might try this out, as might some Bant mages trying to tie together their Goyfs and Pridemages with a cool new toy. Maybe it’s just our imagination, but judging from this list, it feels like Wizards has pushed the power level more than usual in Dragons of Tarkir, and even designed cards specifically for Modern. This bodes well for the future of the format. Bring on the playables! I’m really not sure Myth Realized is anything worth talking about in any format. It seems much too low impact. Control decks are better served with Gideon, who functions as both removal, damage-soak, and finisher, all in one. Similarly, Secure the Wastes isn’t something that any existing deck needs – no one even plays WSZ (except Wafu when he’s feeling frisky), and this is just worse. Again, control isn’t short on finishers. Interesting thoughts on Sarkhan. I was initially excited about him in RUG Twin / Control, but can’t really disagree about the 4/4’s matching up poorly against today’s ground-beaters. 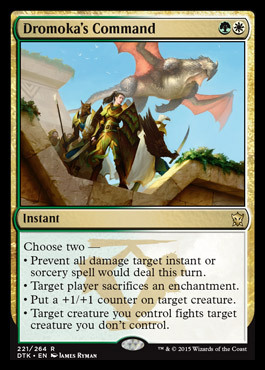 That being said, maindeck Roast doesn’t seem crazy, and maybe balances things out well enough. Sarkhan is a repeated source of card advantage, and a RUG deck is likely playing Goyfs already – I’ve heard those guys are good at blocking. Getting your 5 drop pathed, bounced, countered or remanded is such a huge tempo loss that you probably lose on the spot. Meanwhile if your 1drop gets decayed you probably don’t mind, as that ‘s a decay they don’t have for your other threats. If they are forced to leave mana up for a decay or path it’s also a tempo swing for you. The fact that it dodges Anger, burn and lili while also providing you with a mana sink you otherwise didn’t have is just icing on the cake. This card has a ton of upside for the low cost of 1 mana and I can definitely see it getting played in aggro-control (tempo) decks, perhaps even midrangier control decks. I imagine Virulent Plague can see some play in Modern. At least in the sideboard. It’s an effective counter to twin and BW tokens. Hm, maybe. Illness in the Ranks might be just better; it’s less effective but more efficient.